Where Should We Put A (Downtown) Relief Line? The City of Toronto began a series of public meetings yesterday (March 3) to advance the cause of a a new subway line that would relief capacity constraints into downtown. This round focuses on the question of station locations in the segment from the core area east and north to the Danforth Subway. 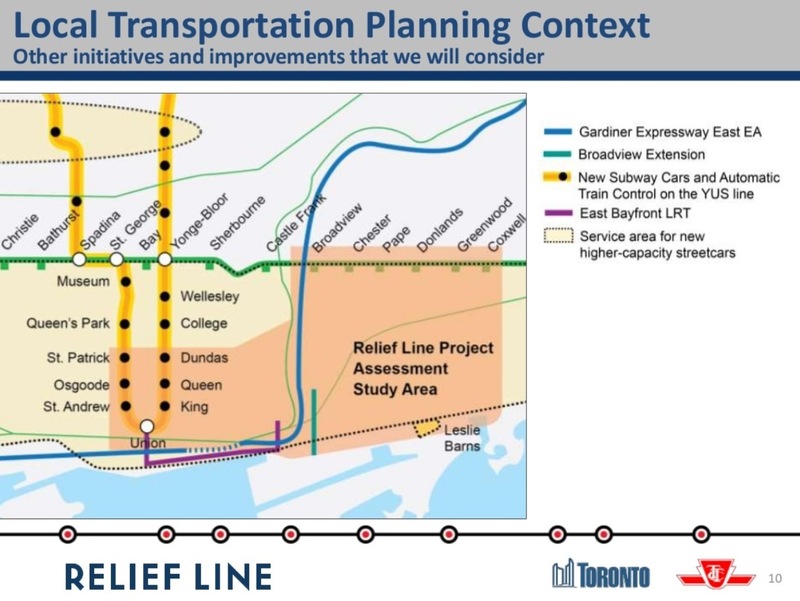 It is no secret that I have strongly supported the “Downtown Relief Line” (DRL) for a long time, and yet I could not help being disappointed by the structure of studies now underway and the public participation process. There is a sense of a process that is too low-key, that may give the impression of movement while failing to advance the cause. In this article, I will review the presentation deck being used in these meetings, the questions being asked of participants, and the shortcomings in the advocacy for this new subway line. 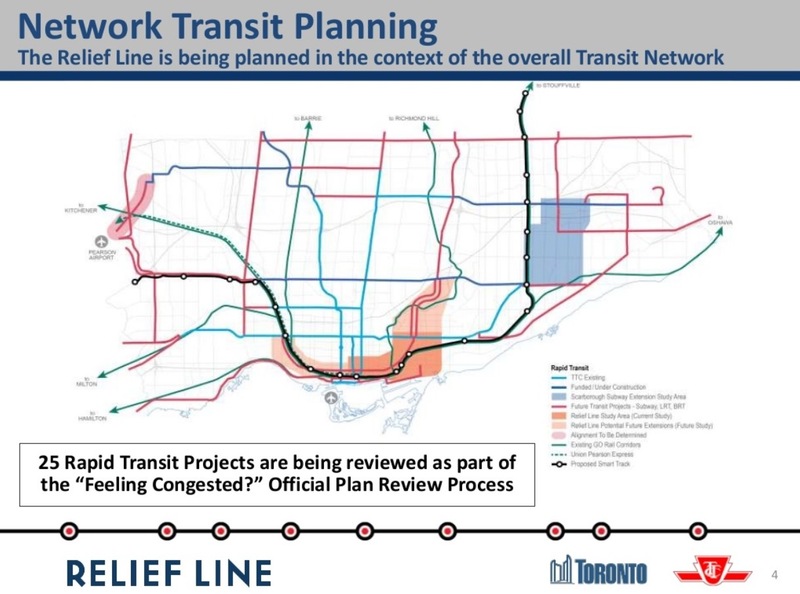 The City of Toronto has a project website containing materials related to the Relief Line including a page with project materials such as presentations at the current round of meetings. The existing conditions page includes links to material such as maps of key destinations and the density of population and employment in the study area. Which sites are “must haves” on any new transit route? These are sites where existing or planned developments are important enough either for the density will bring, or as major future transit nodes, that omitting them from any route would compromise the credibility of a proposed route. What are the likely options for DRL extensions to the west and north, and how will selection of a route for the first phase constrain or support future expansion? The premise of the consultation is that the City wants to know which locations people might prefer as stations, and what criteria should be used to rank choices. However, the most important question — how does a site work as part of the transit network — is avoided because talk of a network would require someone to draw potential lines on a map. Such lines are dangerous — just putting pen to paper has far-reaching implications because the leap from a suggestion to a cast-in-stone “plan” is astoundingly short. However, it is not possible to discuss station locations without some idea of the more likely places a route might actually go, and especially the primary sites it must serve. Talking only about stations sidesteps the delicate problem of the effect a new route would have on neighbourhoods not just at station sites, but for the connecting links in between. This discussion is supposed to be part of the next consultation round likely in early summer 2015, but its absence here leaves the station sites in limbo without a broader context. One could argue that station selection should be unfettered – where do people want stations without preconditions filtering out many sites – and yet the question ignores the real fact that some locations and the routes they imply simply will not work. Other locations are pretty much faits accomplis because of their importance. Such information would have allowed informed feedback provided that it did not come with the too-typical “public participation” that only asks for rubber stamp approval of a predetermined outcome. Planning a DRL will be a politically difficult process not just for funding and regional rivalries, but for the complexity of threading a subway structure through a densely-built series of neighbourhoods. This is not the middle of an expressway or a wide arterial. The inevitable debates must be engaged, not avoided. This section follows the presentation deck in sequence. Slide 4: The network transit context map shows many routes that form part of the “Feeling Congested” review of transportation plans. A notional route for the DRL is shown here stretching from Dundas West Station southeast via the rail corridor, then east along Queen, northeast to Danforth and Pape and eventually north to Don Mills & Eglinton. The map shows two lines in the Danforth-to-Eglinton segment because another option here is the Don Mills LRT. Also shown is the Waterfront East line including an eventual extension east to Leslie Street. Slide 5: Several parallel studies are related because their service territories and purposes overlap. These studies are supposed to “inform” each other leading to consolidated recommendations late in 2015. That process really depends on specifics – where exactly will each line run, which travel patterns will it serve – that require much better definition of project options than a list of would-be station sites. 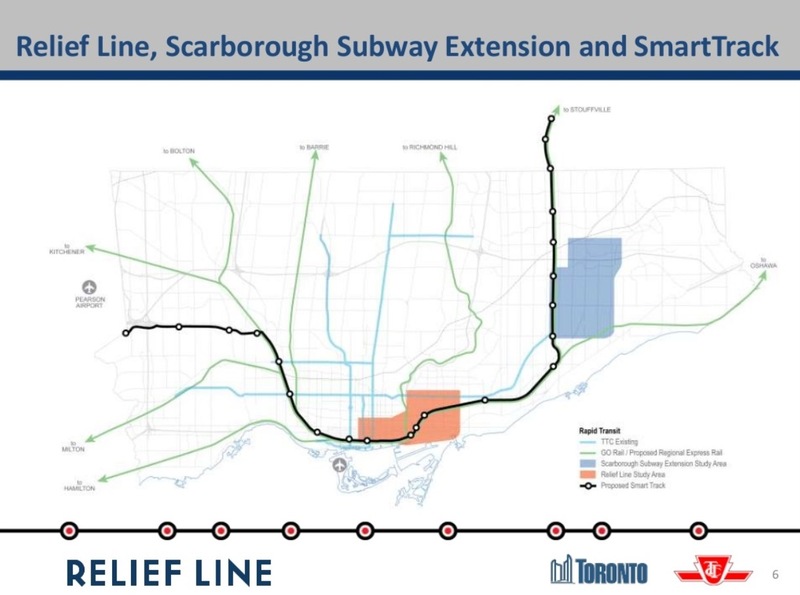 Slide 7: An important quote: “SmartTrack is expected to provide some relief to the Yonge Subway and may delay the need for the Relief Line. This needs to be assessed.” Yes, most definitely,and with a realistic view of the network function SmartTrack is likely to offer given constraints on its service level in the GO corridors. Too much hype from the mayoral campaign painted SmartTrack as a single project to solve all problems to the extent that the Relief line would not merely be deferred but wiped off of the map. Slide 10: The local network context, the “study area”, embraces the core area from Dundas south to Union Station and a wide swath of the east end from the Don River to Coxwell. One part of the wider context is the question of the future role of the streetcar network with new, larger cars and with the demand effects of anticipated developments in new and existing residential areas. This has not received much attention in the larger context of the transit network, and it has only a small political constituency. Other related projects include the East Bayfront LRT (plus eventual extension into the Port Lands) and the Broadview Avenue extension. Because SmartTrack is very much “flavour of the day”, there are already attempts to downplay the role of the streetcar/LRT network with the false premise that the fine-grained service of a surface transit grid can somehow be replaced by a handful of rapid transit stations. This thinking has even infected the Relief Line study as we will see in a few slides. 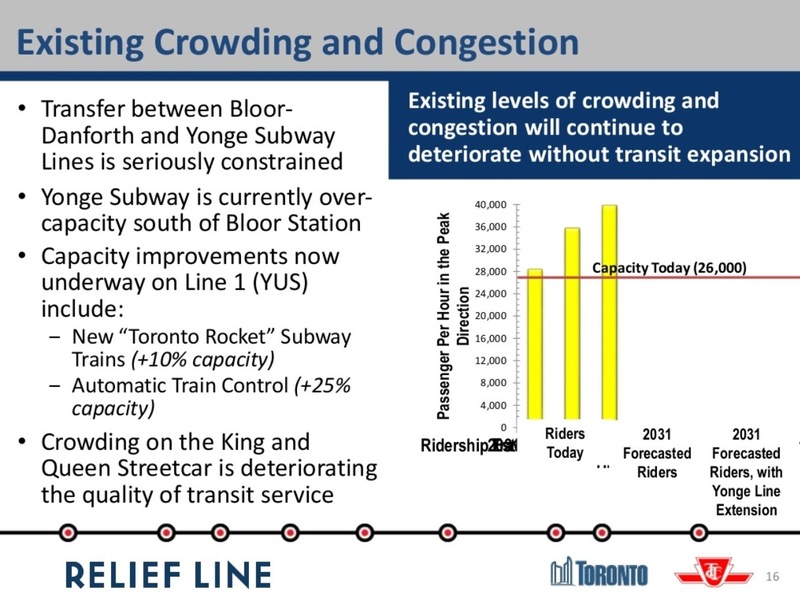 Slide 16: Both the City and TTC acknowledge that there are severe constraints at Bloor-Yonge Station. These arise not just from train capacity, but from the ability of the station platforms and circulation systems to handle the projected volume of passengers. The chart shows a current capacity of “26,000” although the line is actually drawn at the “27,000” mark. 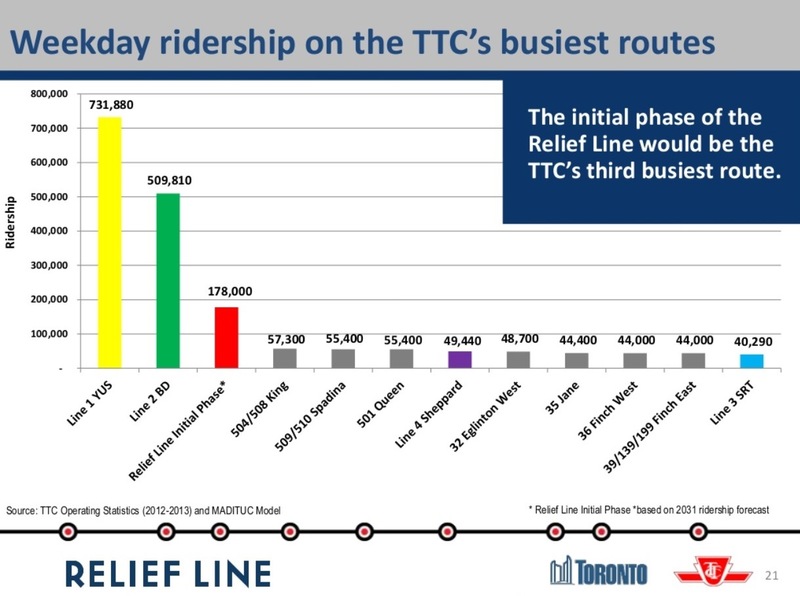 This reflects 26 trains at 1,000 riders each per hour, the line as it was when served by the T1 car fleet that has now shifted to the Bloor-Danforth line. The new Toronto Rocket (TR) trains and their 10% added capacity are already in place on Yonge, and the actual capacity of the line is just over 28,000 per hour (26 trains at 1,080 riders each). More can be stuffed in on a peak, crush load basis, but the line and stations cannot operate on a sustained basis at higher levels. Saying that there is a 10% future growth is misleading because the capacity is already in place. Oddly, there is no reference to the expected 7-10% drop in Yonge line demand that will come when the Vaughan extension opens in 2016 or 2017. A better chart can be found in the “Challenges” section of the website where the formatting is not distorted, and the 26k screenline is placed correctly. The notes below the chart cannot be ignored. Half of the City’s GDP is generated downtown, and one third of all jobs are located there. The pool of office space is growing and at a rate that dwarfs anything happening in the suburbs. Automatic train control is expected to increase capacity by 25% with reduced headways, the time between trains, down from today’s 140 seconds to about 110 seconds (this is equivalent to a change from 26 to 32.5 trains/hour). That would take the route up to about 35,000 passengers per hour. The range cited in the presentation is 33-38K. Past TTC claims have shown capacities above 40K, but this would require heroic changes to the infrastructure and operations of the Yonge line that would be difficult and very expensive. Similarly, proposals for longer, 7-car trains, are a possibility when the next fleet is ordered in the mid 2020s, but there are physical constraints in many locations throughout the network based on the standard 75-foot x 6-car trainsets that have been used for decades. That would add a potential 10% to line capacity, provided that longer trains were technically and physically possible. The DRL vs Yonge expansion debate has always been clouded by its focus on the high cost of any new downtown subway, but the cost of retrofitting the YUS to handle larger passenger volumes, and the exposure to greater effects from a single failure in the core area, are never mentioned. A proposed $1-billion expansion of platforms and circulation at Bloor-Yonge is never mentioned as an offset to the cost of the DRL, nor are the extra trains the YUS would need to operate at a higher capacity. To say that this skews the argument against a Relief Line is an understatement. Slide 16 also claims that “crowding on the King and Queen streetcar [sic] is deteriorating [sic] the quality of transit service”. 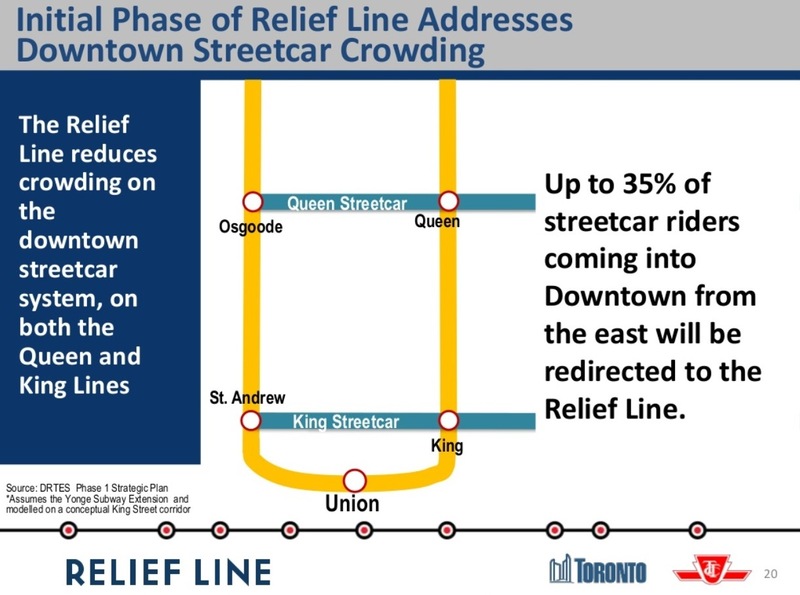 On Slide 20, we see a claim that a Relief Line could reduce streetcar demand by up to 35%. This is based on a King Street alignment for the Relief Line. This is nonsense on a few counts. First, there is not enough scheduled service – peak service runs every 5 minutes on a line that once had cars every 2 – and far too many of these cars never reach their destination at Neville Loop. The problem is not one of limited street capacity, but of service level and reliability. This can be fixed tomorrow, and a Relief subway is not required, only the will to operate more and better service. Second, reduced demand implies that riders who have finally gotten on to a Queen car would choose to transfer to the Relief Line. If we we know anything from the Scarborough debates, it is that riders do not like to transfer, especially if this exposes them to the elements. The trip from south Riverdale to the core is relatively quick because there is little congestion on that part of the route. Any travel time saved on a DRL must be balanced against the extra transfer and wait time, plus access time from a downtown station. As for the King car, it accumulates a substantial load at stops along its route down Broadview and west (eventually) along King. It does not leave Broadview Station packed with transfer trips from the subway. Moreover, if there is a capacity issue on King, it lies more to the west of the core, an area the Relief Line will not touch in its first stage, if ever. What seems to be happening here is “mission creep” in an attempt to show how much the Relief Line could do. Such efforts might better be directed at talk of redevelopment on the DRL extensions, notably the benefit of heading north through Thorncliffe Park to Don Mills & Eglinton. Alas, that is outside of the study area and therefore ignored. Slide 21 places the Relief Line in the context of other transit projects. With a daily 2031 ridership of 178,000, the line would outstrip by far all of the heavy surface routes, as well as the Sheppard Subway and Scarborough LRT. Although not shown here, I suspect that the Scarborough Subway and the eastern leg of SmartTrack would not fare as well as the DRL either. The remainder of the presentation takes us into the station location issue I have already discussed above. “Relief” is always something for another day, or another proposal such as RER and SmartTrack. What we will almost certainly learn as the Metrolinx studies advance is that there is a limit to the demand the commuter rail network can handle, no matter what colour or logo one puts on the trains. There are physical limitations on individual corridors, and a combined limit on train and passenger volumes at Union Station. The rail corridors can divert traffic particularly from the outer 416 and inner 905 away from the subway lines, but the fundamental problem is that there will be more demand into the core than capacity. The Relief Line cannot be wished away by election rhetoric, and ignoring the eventual need for a new central subway route is folly. Sadly, Toronto Council and Queen’s Park are very good at “folly”. What is badly needed is real advocacy for the DRL for its potential role in opening up capacity to the core and to areas beyond the core an expanded route can serve. This is an economic development issue that will benefit much of the City, not just a few blocks near King and Bay. Picking ideal station locations on the first, truly “downtown” stage of the project perpetuates the idea that this is somehow a route to take folks from Riverdale to the business district when the Relief Line’s role should be much greater. Toronto needs to talk about that wider context and build a constituency for the Relief Line beyond Danforth and University Avenues. This entry was posted in A Grand Plan, Downtown Relief Line, King Car, Queen Car, Transit. Bookmark the permalink. Frankly I suspect that the models are being tweaked anyway, so the value of time is not really being used to select a route but rather justify its existence. If the existence can be justified using a lower number it will harder to assail. I think you are absolutely right. The problem is if the “analysis” is nothing more than rationalization to justify preexisting bias, then the “analysis” provides absolutely no objective guidance. If this is the case, can the reader then come to the conclusion that the authors of the study have fulfilled their fiduciary duty to promote the public good? Steve: It is illuminating to consider that the document entitled “The Business Case for the Regional Relief Line” which underpins, so to speak, the SmartTrack proposal, contains barely one page on the nominal subject, and implies that a study exists somewhere to back up the report’s conclusions. However, none of the assumptions or calculations are published. This is what passes for “transparency”. Sounds exactly like the Planning Department … come to think of it, it sounds like something right out of Yes Minister! too. Even when you have something like an EA, the bias is evident – expect the “EA” for the airport expansion to be a perfect example. It occurred to me that any reports done for government need to be hired, paid for and directed by an independent body other than the one directing it – as outside consultants who bite the hand that feeds them will never get hired by anyone else. I won’t claim to be nearly as knowledgeable as other posters here on technical issues, but the time to decide on the route for the DRL is NOW. That route will be passing through downtown, so it is imperative that the powers that be decide right now where the line will be, while there is still space to build it. Not only that, but we must determine right now where we want the line to go next, westbound. Do we want it to go to the Liberty Village area? Do we want it to go to Exhibition Place? How about the extra GO station at Front and Bathurst (or Spadina) that have been proposed? There may be other options as well, including stopping the line at University (not my preference). Whatever the choice, we need to make sure now that there will still be space to put the line when we build it – and if we are not sure where we want it to go next, let’s secure the space for two alternate routes now. As for phase 1, Wellington-Front is to me the best route possible. At the east end, up Pape and then, ASAP, up to Don Mills and Eglinton. Stations: University/St. Andrew’s, Yonge/King, Jarvis, Parliament,River, Eastern/Broadview, Carlaw/Queen, Gerrard, Pape/Danforth. From there – O’Connor (or Cosburn), Thorncliffe Park, Overlea/Don Mills, St. Dennis, Eglinton. And, please, please, let’s build the East Waterfront LRT now! @Sergepaquet – the thing is that looking at ridership data, available space for redevelopment, and network connectivity gets you a good idea of what is required. The lack of options of where it can be run goes a long way to filling the balance. So a route that would allow a Bathurst Yard Station, support a route for WWLRT connection, a Don River crossing to support new development and also connection to set and good LRT options north of Danforth (based also on current ridership and density) form a reasonable basis for routing now. I would agree the route could and must be set now and protected whether it is funded or not. The future needs to the north and west to be protected now, whether for construction now or later. This route being more constrained now than most the time to protect something is now, whether the route is perfect or not. PS When I say this route I mean as opposed to other subway projects, like the SSE, which will have more flexibility in routes. Steve: In one of those “might have been” moments, a potential route linking diagonally from Wellington at Blue Jays Way (Peter Street) southwest to Front and Spadina has been lost to a proposed new development. This was the old freight lead from the yards west of Spadina to the CPR lands where Metro Hall is today. The failure to select and protect a route is a direct result of the “we don’t really need the DRL” attitude that has infected both municipal and provincial planners for far too long. One of the things I asked about at the public meeting at St. Lawrence Hall was whether they had studied the potential risks of using 1 yard for two lines. Infected is right. I would have added “continues to infect” and include “politicians” too. So, is a Wellington-Front made impossible by this development or simply improbable (and high in cost)? It seems to reinforce the idea of a DRL that will cross the city east-west rather than the diagonal option … suggesting that this “pick a station and we’ll plan a line” consultation exercise may not be as open and flexible as implied. Of course there are only so many possible routes and station locations and there are obvious constraints in any project … but wouldn’t it be better to share this than to present as broad a list of options as possible (which then requires time to winnow down … with necessary explanations). Steve: That has been exactly my point: the idea that we can just pick station locations without regard to some basic knowledge of which “hard” constraints exist on the final route is a misleading and time wasting form of “consultation”. Why don’t Milton trains stop at Bloor station? If they start doing so, then this line together with the Kitchener Line can provide an effective replacement for DRL West the same way as Stouffville line / SmartTrack would provide replacement for DRL East. Until which station is the Kitchener Line double tracked? Steve: The Milton trains come in on the CPR line, but the original platform at Bloor Station was on the CN line which runs parallel; ergo no Milton stop at Bloor. This has never been a high priority for GO because the same trains connect with the Bloor subway at Kipling Station. As for the Kitchener line, it was single track north of West Toronto until the Georgetown South project expanded the corridor. As the name implies, this gets the double track out as far as Georgetown, and there are separate plans to extend beyond that. In September 2014, Ontario purchased the line between Georgetown and Kitchener, and there are plans to double track it so that service can be expanded. If it cost 1 TTC fare to ride the GO train between Bloor Station and Union and that came with a free transfer to the subway at Dundas West then it could certainly help but it would do little for passengers who would take the streetcar from Dundas West to their final destination somewhere in the west end since there are no stops between Bloor and Union. Steve: Yes, there has been far too much talk of the DRL and of the transit system generally as if the only purpose is to move people to and from Bay & Front. All those places in between just don’t count when the goal is to “proove” that one “Smart” line on the rail corridor can solve every problem. If this is the case, can the reader then come to the conclusion that the authors of the study have fulfilled their fiduciary duty to promote the public good? The issue is that it’s politics that constrain construction. Look at the Allen Highway or Eglinton Subway. When “pie-in-the-sky” studies are done, they rarely translate into reality, because of funding or social constraints. Even then, specific projects need to be cross-compared to see which is of better value. Any judgement of value is subjective, and so pre-existing bias exerts itself. Fiduciary duty is to promote the least bad option available. … the same way as Stouffville line / SmartTrack would provide replacement for DRL East. DRL East is needed in addition to any transit expansion on the Stouffville line. Specifically, it’s capacity problems at Yonge-Bloor. Matthew in terms of capacity issues – I would add that this issue is gradually extending North on Yonge, and will be an urgent issue soon at least as far as Eglinton, but has not yet become an issue on Spadina – thus DRL west is not yet required. Real service in UPX would be nice to link Rexdale, but that is another issue. Why don’t Milton trains stop at Bloor station? Aside from the reasons already mentioned, adding a stop at Bloor would add time to the trip and wouldn’t offer much of an improvement for users who already have the option of Kitchener line trains (which will include 10 daytime trips between Bramalea & Union later this year). Until the Milton line is running 2 way all day service every 10-15 minutes (which is on the 25 year horizon now … if ever) there will be little point in adding a Bloor stop … plus there is a constraint in adding a platform and track to the west of the existing track. I would argue that it is much easier to build political consent when a project represents an optimal utilization of public assets. Although there is a degree of subjectivity in any decision, there are objective valuation tools that can provide reliable data to guide the planning process. Our discussion is about building a subway into what is arguably a region that has the highest long term growth potential in the country. If we are complacent, suboptimal planning will constrain economic growth for generations. Your previous passionate defense of NAFTA was impressive, however if you actually believe what you are saying you must agree that a trade agreement is not enough, a society must build optimal structures to maximize the benefit it receives from trade liberalization. We then must ask has our planning adequately accounted for future trade deals such as CETA (the trade deal currently being negotiated with Europe). What is the point of a significant comprehensive trade agreement if those guiding society are unwilling to take advantage of its benefits? If this is what passes for fiduciary duty in Ontario then I am not surprised when the Institute for Competitiveness and Prosperity comes out with figures that illustrate how Ontario’s productivity has systemically lagged behind its US peer for the past three decades. @Jon Johnson – I think in the end, yes using best tools is critical, however that starts with leadership. It requires using hard data and being prepared to take knocks. However the more complex the model, the more there is to tweak, and argue about, the more “fair” sneaks in at the edges. Current ridership and a detailed location of origin destination pairs would permit a good look at what would represent the most time saved total for the next 10 billion spent. The other consideration must be how the next segments of transit can then be connected. The important part is leadership not data. The data is a result of leadership as data can be collected if it is seen as important, however data does not create leadership. Having said that the limits of routing and ridership have provided enough information to say what should not be done, and what is required, and yet we insist on placing high cost low return projects first. Ego before yield, polls before ridership. Data has been ignored in the past and will be until we the voter chose to support that which makes sense over what we lust after. I would argue that it is much easier to build political consent when a project represents an optimal utilization of public assets. Humanity is notorious for not picking the option that’s best for us. “Fairness” and “narrative” seem to dominate rational decision making. Just look at the anti-vaxers, they are held as a global example of stupidity in the face of mounds of evidence. There is no objective optimal utilization of public assets because there is no objective consensus about optimal living, even when we do agree on the best end result, we can’t agree on what’s the best route to get there. The best that we can do it work towards the currently preferred goals along the path of least resistance. I support free-trade agreements because they open new options and equalizes standards. We might not take full advantage of the benefits, but we could and we gain some measure in the meantime. Transit planning is the same, we have the technically possible option of banning private vehicles in parts or all of Toronto for transit corridors, but the likelihood is near zero. Barring a fundamental shift in our usage, the DRL represents the biggest need/positive effect per dollar spent. Is it optimal? Probably not, but it is the best we’re willing and able to do. I am not surprised when the Institute for Competitiveness and Prosperity comes out with figures that illustrate how Ontario’s productivity has systemically lagged behind its US peer for the past three decades. The ICP does some interesting work, but I dislike their flexibility with numbers. They don’t provide tables for their basis of analysis, only graphs that support their narrative. Their 2014 Annual Report uses 2012 Dollars for international comparisons and 2013 Dollars for North American comparisons; they use GDP not PPP, which favours US economies. Ontario is above median for GDP per capita if looking at all US states and Canadian provinces. Their list of “peers” is arbitrary, as Washington and Maryland have larger GDPs than Indiana, and Texas is the next closest with population density at over three times Ontario. This is just like the transit reports that are issued to support their desired project. It requires using hard data and being prepared to take knocks. The issue is that there is no hard data, even if we had a perfect knowledge of today’s transportation demand patterns. We predict the future based on the past and “best guess” of future developments. However, the specifics of what past information and future development that are included in the models dictates what comes out. Data has been ignored in the past and will be until we the voter chose to support that which makes sense over what we lust after. The issue is that our politicians are generalists, not specialists, so making the right or wrong choice in transit ends up influencing maybe 5% of overall opinion. So long as they don’t make enough bad choices in enough different areas, then they can continue to make more bad decisions. Once they are replaced, the situation resets and doesn’t promise any improvement in the choices being made. @Matthew Phillips – Yes , the voting public has shown an increasing tendency to vote with ever more regard to what they want to hear, and less to what includes bad news for their narrow wants. There is hard data (although not perfectly collected), we know ridership on existing routes, station usage and population densities. We have broader survey data. This would allow even the interested public to conclude that some routes will not work well or will be over built. There is real data to use to ask basic questions on some proposals, yet we chose not to. Basic estimation can used as a tool to formulate basic question and test logic. Politicians are delivering what they are rewarded for. This applies to transit voting also. We need to hold ourselves responsible. We can look for incremental improvements in performance but we need to apply common sense. A single line does not solve all issues, everyone knows this before we start. A bus route with a daily ridership on 20k does justify a subway ditto. Yonge is fully loaded…, ignoring basic facts is a choice to seek advantage, in a narrow way. If we vote against pols who do this it will stop. There is partial hard data of existing conditions, but in theory we need to build more before things hit a wall. To do that, we step outside the realms of hard data into statistical simulation. For example, Ontario consistantly pegs future transit use as a higher percentage of journeys, not because of statistic evidence, but because it’s the desired result and public policy. I’m not saying it’s a bad assumption, but it is a source of bias attached to political ends. If the OPC comes to power, then maybe this policy goes away and much of the anticipated need for extra capacity fades too. This does change future reactions to some degree (more people buy cars because there isn’t space on the Yonge line), but beyond that future conditions are unknowable. We suffer from a First-Past-The-Post system, that rewards ignoring the majority on a broad array of topics, while providing a plurality their desires on a few targetted areas. Voters need only compare a given party to the best/worst position on an issue. The party with the most bests and least worsts in the individuals oppinion gets the vote. I probably wouldn’t vote for a OPC candidate that offered to cut 500K public sector jobs and put all the money into infrastructure in the GTA. The problem is partly however, that voters have allowed themselves to be pulled to extreme positions. This reduces the degree of swing vote, and increases what is required to get them to swing. 50 years ago in Canada it was a race to the middle, and this is why the Federal Liberals were dominant, and why the Ontario Tories were so much Red Tory dominated. Now we see a race to the extremes. The system itself has not changed, but the gap between party positions has, and the need to present balanced positions has. I would put to you the Conservative Party of today, is a product of this push to the edges. This to me is a question of voter behaviour, and rewards to the politicians. If more people would change their vote based on politicians promising the stupid, the promises would change also. 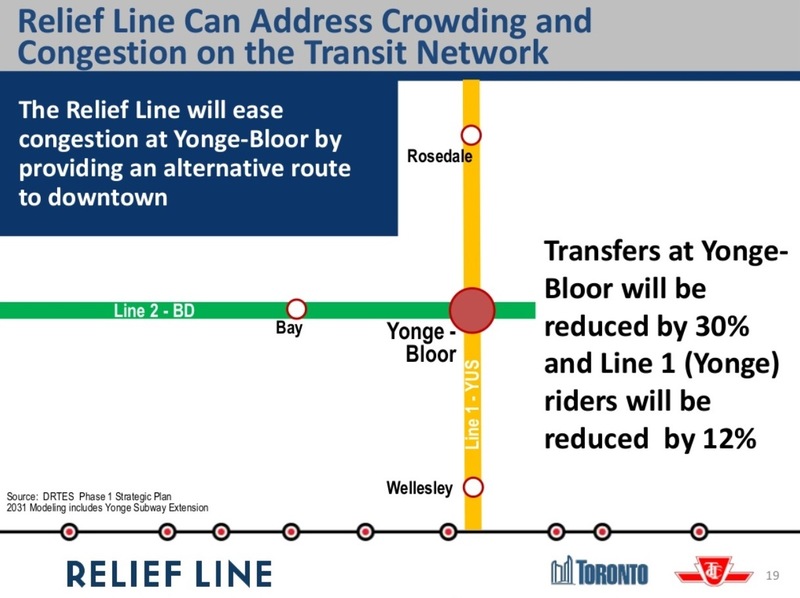 A Bloor-Danforth Downtown Loop via University could be utilized to relieve Yonge line overcrowding and having the wye in place already will help this endeavor. Two new lines would be inaugurated: the Danforth-University-Yonge line (D-U-Y) and the Bloor-University-Yonge line (B-U-Y). From the Yonge Station moving westward, half the traffic from the east would utilize Bay-Lower along the new Danforth-University-Yonge line (the other half of the traffic would continue to use Bay-Upper and continue to Kipling). Moving toward Museum, the 2 tracks would branch into 4 tracks with the middle tracks merging into the Y-U-S tracks as they do now and the outer tracks diving below the Y-U-S tracks. From the Spadina (B-D) Station moving eastward, 2 addition tracks with half the traffic from the west would branch off the 2 tracks that enter St. George-Lower and dive into a 3rd Level St. George Station along the new Bloor-University-Yonge line (the other half of the traffic would continue to use St. George-Lower and continue to Kennedy). Moving toward Museum, the 2 tracks from the St. George-3rd Level would merge with 2 tracks from Bay-Lower that dove under the Y-U-S tracks. Museum would become a double deck station (Y-U-S on the upper level and the D-U-Y/B-U-Y on the lower level). Stairs, escalators, and elevators would be utilized to connect the platforms. This configuration would continue from Museum to Wellesley. Moving toward Bloor, the D-U-Y/B-U-Y will dive under the Yonge Station; this will be the last stop northbound. North of the station, there will be relay and layup tracks. Since Bloor-Lower will be the origination stop of the D-U-Y/B-U-Y lines southbound, trains will come into the station empty from the relay/lay-up tracks. Passengers from east or west can change at Yonge, go downstairs (instead of upstairs) and enter an empty train on the D-U-Y/B-U-Y platform (instead of a packed train on the Y-U-S platform) to travel south or take alternate trains on Bloor or Danforth that will loop downtown via University.